We try to stay in touch with all our stakeholders. Almost all our communications nowadays are via Internet: our Daily Illuminator blog, our Twitter feed, our forums, the web pages for our games, and the letters that go to the 200+ people and companies to whom we pay royalties. And, starting in 2004, I've written an annual report not unlike the "report to the stockholders" that you'd expect from a public company. This is it. We are, as I assume the reader knows, a publisher of games. Many are digital downloads sold through our e23 site. We also publish two magazines: Pyramid (a monthly PDF release) and the Journal of the Travellers' Aid Society (a biweekly online zine). We have been in business since 1980. We currently employ 27 full-time staff and contractors (and need a few more), plus several part-timers. We kept our core Munchkin sets in print almost all the time, despite high (and sometimes spiking) sales. We released two new Munchkin core sets, and both were popular. Sales of the new dice games stayed strong, accounting for about 5% of total sales. Zombie Dice was our #4 item ranked by dollars. We continued to offer RPG support, mostly in PDF form. We shipped 54 different items (one more than last year): 26 new, 28 reprints. The Munchkin line, including the Munchkin Quest boardgame, accounted for about 75% of our sales. Munchkin is now available in 15 languages, with one more licensed. Previously, we had avoided licenses for Munchkin, on the theory that we could sell plenty of games without them. However, when the opportunity arose to license Conan the Barbarian, we thought it would be fun. As it turned out, the fans thought so, too. Later in the year we released Munchkin Axe Cop, based on the hit webcomic, and fan reception was again good. 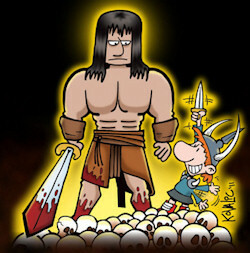 We'll do more licensed versions of Munchkin in 2012, including the Munchkin Conan core set now about to go to press. Munchkin Zombies was our other new core set in 2011, and it was such a success that we're already on the third printing. We also released an expansion and are working on another one! Conclusion: somebody out there really likes zombies. We produced a lot more Munchkin accessories than in years past. We did fewer boosters, but they sold very well. Retailers tell us they like having Munchkin items at a variety of price points. Andrew gained a level in Game Designer, taking Munchkin 8 in hand and dragging it onto the 2012 release schedule. As this is written, that's only a couple of weeks away from stores. At PAX East, Steve was interviewed by G4. At the New York Comic Convention, Phil was interviewed by MTV Geek. Munchkin was mentioned on CNN Money. And in early 2012, mtv.com published an in-depth article about how Barnes and Noble got into games. B&N likes Munchkin! Our online store was profitable. We're the exclusive online retailer for some excellent publishers, including Atlas Games and Grey Ghost Press, and we're happy about that. We started work on a new shopping cart that will let customers buy both physical games and PDFs at once. It's a big job, but we intend to roll it out in 2012. Sales in our digital-product store, e23, went up again in 2011. We think we're the #2 or #3 seller of downloadable files for the gaming community – but this is a guess, as we have no figures for the competition. We added a bit more content than we did last year: 33 brand-new PDFs (mostly for GURPS), 31 PDF editions of previously printed books, and 30 PDF editions of previously printed magazines. We also added new PDFs from Amarillo Design Bureau, Atlas, 0one Games, BTRC, and other publishers. The ADB releases were especially successful. Our business organization remains reliable. Our financials and royalty payments have stayed up-to-date for years. Our cash flow report is now routine. Thanks to massive Munchkin print runs, we hit what could have been a nasty cash crunch in the middle of the year, but we saw it coming and got past it smoothly. We still need a formal budgeting process. We have no advance budgeting here; we get by on a few ancient but effective rules of thumb, diligent cost accounting, and a dash of paranoia. Again, I worked only two days a week in the office, on both management and game development. And still, even when "at home making games," I was answering a lot of management mail. But progress continues. Many thanks to Phil Reed, our COO, for making it possible for us to have such a good year without my coming in every day. We now have our schedule for the next few months, with status of each project and whose hands it is in right now, projected on the wall outside the Production department and updated in real time. This is both awesome and useful. In October, and again in December, we paid out more than $10,000 in e23 royalties! The other months were good, too, but October was the first time our payments hit five figures. That means both that we're selling a lot of PDFs, and that a lot of writers and small publishers are earning money. 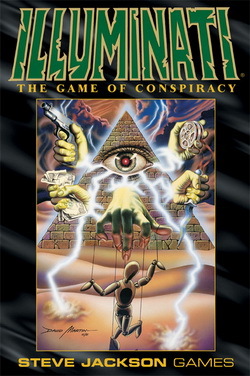 Illuminati remained an evergreen; the core game, by itself, was 2.9% of our sales. Not shabby for a game that turns 30 this year. Viewers of the hit webseries The Guild saw Munchkin in multiple episodes. We won two Origins Awards: "Best Gaming Accessory" for the Cthulhu Dice Bag, and "Best Family, Party, or Children's Game" for Zombie Dice. And Munchkin got into Target! We got the Android port of the Munchkin Level Counter done, just in time to learn that it looked bad on many Android-based tablets – because it was designed for a phone, not a tablet. The Zombie Dice app was upgraded to support multiple players. And that was it. A couple of other app projects are in the works but did not mature in 2011. As last year: We really need a full-time producer to manage our digital development, because my own time is one of the biggest limiting factors on app contracting and testing, and therefore on app release.
. . . being developed by Tinderbox Entertainment, is moving forward, though we have nothing new to show you right now. Maybe next year this entry will be in the High Points section. We made some good additions, but we also lost some experienced staff members, most notably Marketing Director Paul Chapman. However, Paul didn't go far; he just moved to PSI, which handles our fulfillment and book trade sales, so we're still working with him! We know we still need to add more people. Perhaps the first addition should be a Human Resources specialist, to hire the rest . . .
We believe in offering good benefits. We offer a paid BCBS health insurance, plus dental and vision plans. In 2011, we gave holiday bonuses totaling 8.4% of payroll, plus some modest raises. As in 2009 and 2010, we had two “office closed, but everybody gets paid” weeks – one in summer, one at the end of the year. We held two paid Game Days in the office. Our pipeline remains full of partially-completed games, so we are still not soliciting outside submissions. 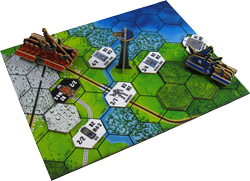 The only unfinished game that got serious work was Castellan, but based on fan reactions at conventions, it will be one of the success stories of 2012. We did GenCon and both PAX shows in a big way. We looked good, but we spent too much money and gained too many gray hairs. At PAX Prime we ran our own retail room, and learned that we don't know how to do convention retail any more. At PAX East we ran a huge demo area and let Compleat Strategist handle the retail, and that worked better. Things that didn't go as they should have . . .
We have known for a long time that we should be selling our out-of-print books as PODs. But we still have not gotten around to it. Maybe in 2012, and maybe not. Once again, we didn't launch UltraCorps. A few bugs were tweaked; it's now, pure and simple, a case of my own bandwidth. We intended the super-deluxe $100 edition of Ogre to be a 2011 release. It wasn't. Again, the problem is my own bandwidth. I'm trying again in 2012. The Essen show in Germany had record attendance. No major game publishers went out of business in 2011. One valued outlet, Borders Books, died a slow and protracted death. Prolific hobby publisher Z-Man Games was sold, though founder Zev Schlasinger continues to work with the company. Fantasy Flight announced a Star Wars license. Keep the core Munchkin sets, and Munchkin Quest, in print. There were a few gaps, but overall, we did well. Ship several new Munchkin releases in a variety of formats (including digital); get Munchkin into new markets; promote Munchkin aggressively. We succeeded wonderfully, except for the digital part. We had lots of new releases, including core sets Munchkin Zombies and Munchkin Axe Cop. And late in 2011, Target tested Munchkin successfully and added it to their game shelf! Release more dice games, and possibly one or more small card games at a similar price point. We released one new dice game, Trophy Buck, plus the "Giant" edition of Cthulhu Dice. No new card games. Communicate better and promote ourselves better, starting with a serious upgrade of our web presence and our online store. We started work on the website and store, but we have a long, long way to go. These look a lot like the priorities for 2011, because we succeeded pretty well on the 2011 priorities and it gave us our best year ever. Keep most of the core Munchkin sets in print. However, just to control our own inventory and the retailers', we will let some of the slower-moving core sets go out of print for a few months at a time. Munchkin Quest will also disappear from the shelves for a few months this summer to let the retailers sell all the current stock, because we're going to have to raise the price on the next printing. Just like last year: ship several new Munchkin releases in a variety of formats (including digital); get Munchkin into new markets; promote Munchkin enthusiastically. Very much like last year: Release more dice games, and possibly one or more small card games, or even "toylike" games, at low price points. Clean out more of the old pipeline. Make Ogre 6th Edition happen. Finish the upgrade of our website and online store. Make it excellent.